My mom was like this with homework. She'd ask if I had any and if I'd done it, and would just accept my answer. It...didn't work out at first, ha. And then I missed a deadline on a large project, and learned my lesson. Sixth grade was hard, man - ha! Since I homeschool, I always know the kids grades. ;) But I agree that kids need to learn responsibility, and it starts with the little things. It's better to have them learn now and make mistakes on a small level than be unprepared for the big things when they move out and go to college or live on their own. I completely agree. This is something I'm having to work on with my son. Up to now, though, his school has not made it an easy task. They are sticklers for "parental involvement." Thanks to the way they've always structured assignments, my son still believes he's not supposed to do his homework without me. Last year, we had a battle over reading on his own--he was under the impression that he wasn't supposed to read by himself AT ALL. Now we've managed to get over that hurdle (somewhat), but the rest of the homework remains. It's pretty hard to teach individual responsibility when it's been drilled into his head all this time that he HAS to have me sitting there, actively involved in the work. He's starting to learn that fifth grade is different and that he is now allowed to do it on his own, but after all these years of being taught otherwise...I see more battles ahead. I'm also working on teaching him responsibility for his chores. This has been a tough one, too, and in this case, I have no one to blame but myself. I was way too lenient with him for far too long, and now I'm paying the price. However, the time has come to buckle down and make him work for his allowance and privileges. No more letting him have it anyway after only doing a little of the work or none at all. I'm learning to really put my foot down and mean it. Anna - put the kids in contests or let them pay their own library fines! It's a perfect way to learn while homeschooling. You're such a smart mom! I taught kindergarten for four years, and I always wished parents would understand this idea better. Words of wisdom, my dear. 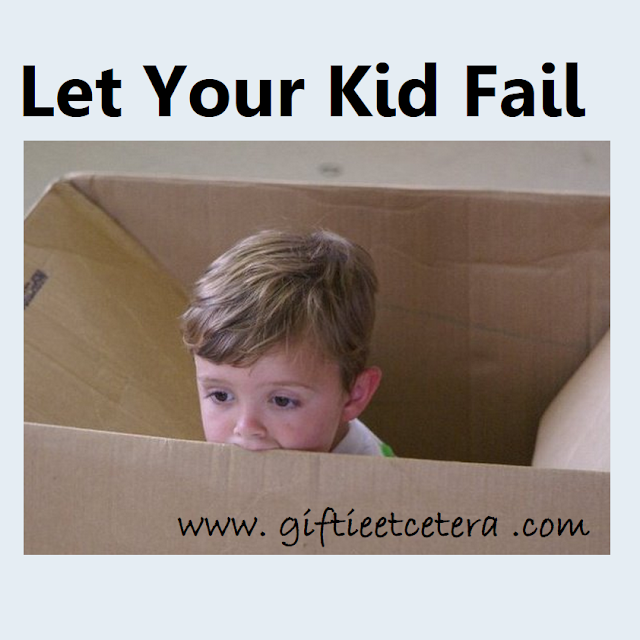 As a mother I know what you mean about haing a hard time letting kids fail in order to learn, but it is needed. Thank you for sharing this great post with Roses of Inspiration. My daughter just started 1st grade and my plan is to do take this course of action with her. Don't know if I'll actually have the courage to do it, lol! It is hard to sit back and watch your child fail at something. I have learned that through these middle school and high school years. I have one child that loves school so much, he thinks a B is just unacceptable. My other child is convinced that school is evil and she hates going, can't wait for the day it was over. My favorite line this week was when she said "When I turn 18, I am quitting school and moving out. I'll take care of myself." As hard as it was, I turned and looked at her with the most serious expression asking how she would pay these bills. She, of course, responded by saying I would pay them. I couldn't help but laugh as I explained that "That is not taking care of yourself." Thanks for linking up to the Country Fair Blog Party. I do hope you will join us again tomorrow! My daughter is only 5yrs old and I was just thinking about this the other day. Trying to let her fail the first time will be hard but I know it's for the greater good. Better to learn it now I agree.